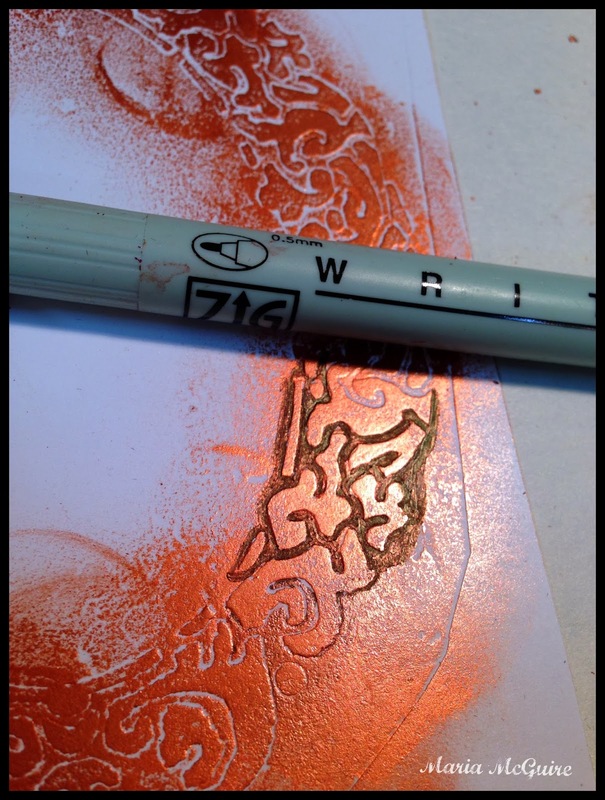 StencilGirl Talk: Embossing with Stencils! 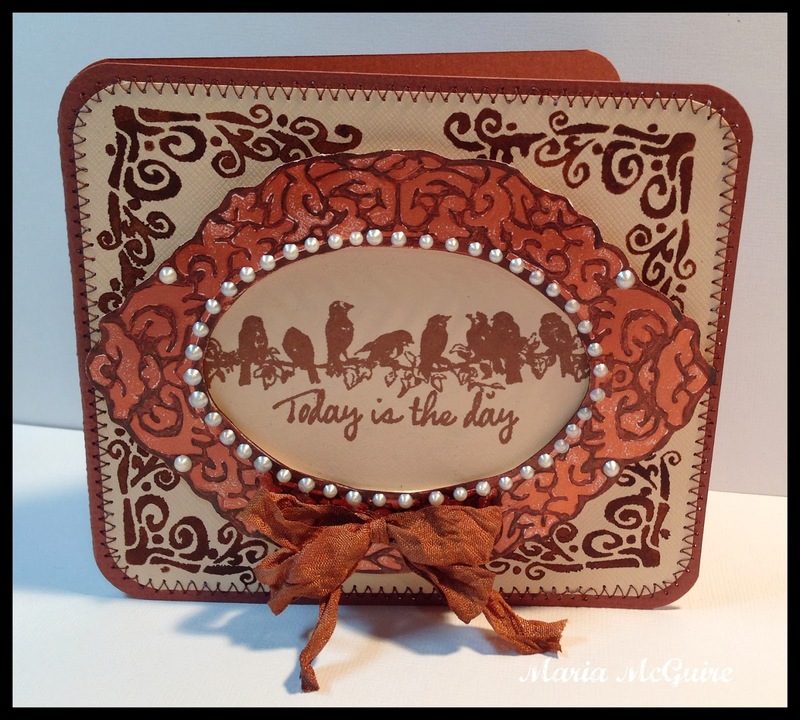 featuring her Frames stencil from StencilGirl! 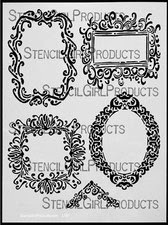 When I saw Jessica's Frames stencil I immediately thought papercrafting and cards. I wanted to make a card, but I wanted to make something different for you and show you how to use your stencils in a different way. I....now stay with me and don't get frightened.....cut my stencil apart! Using my Cuttlebug Embossing Machine, I used a plain white piece of cardstock and layered it in the Cuttlebug the following way from the top down. Stencil, paper, C Plate, B Plate, A Plate. Using Viva Decor Gold Metallic Rub in copper, I lightly rubbed the product over the embossed design to bring out the embossing even more. I then used a Zig Pen in the valleys to define even more. 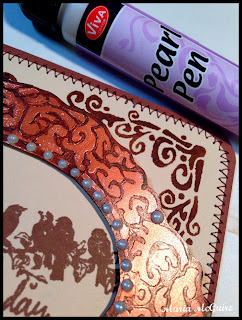 The corner piece on the Frame stencil became another embellishment on my card. This time using traditional paint through the stencil I stenciled the corners. Added accents with a Viva Decor Pearl Pen added a finishing touch. Sentiment and bird stamp by Melody Ross for Unity. Please make sure you check out what the other artists did with Jessica's Frame stencil. But....before you go, please make sure you leave a comment because Jessica is giving away one of her Frame's to one lucky viewer! Just leave a comment below and you will be entered to win! All comments on the Test Drive are eligible so the more you comment the more chances you will have to win the stencil! I hope 'today is the day' I win one of these stencils!!! you have created a gorgeous card Maria-love it!! Lovely! Why not cut them apart!? 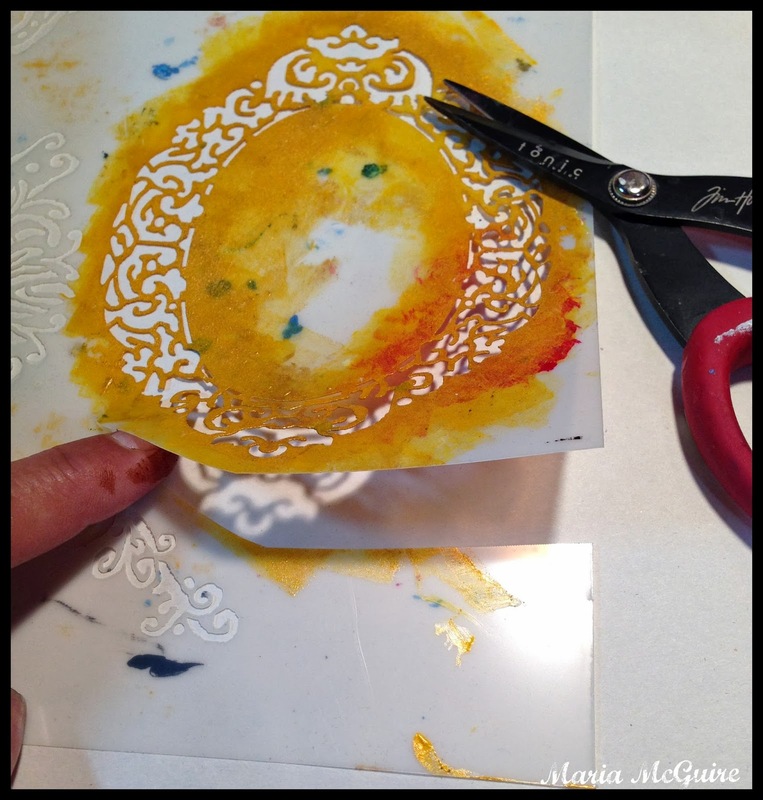 Chances are you would only be stenciling with one frame at a time anyway! WOW.. just beautiful. You go the gift, my friend. Nice card. 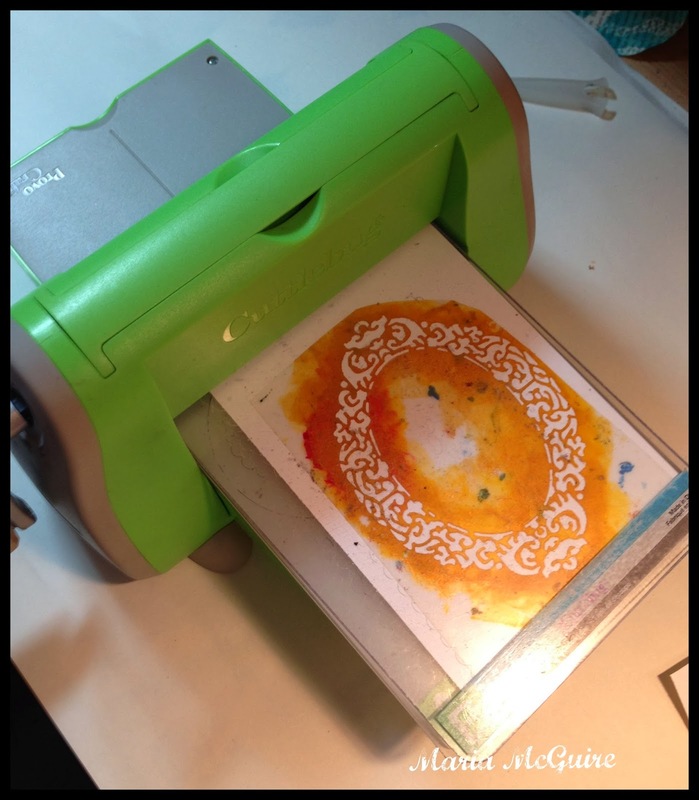 Thanks for the chance to win this versatile stencil. This is SO GORGEOUS, Maria! You have so very many creative ideas!!! lovely card!! I still have to go back and read what you said about CUTTING your stencil apart. I about fell out. Great card - excellent ideas. Nearly fainted when you said cutting. I thought you were going to cut out all the internal tricky bits as well. wow, is an amazing Project, love it! Oooer...you cut it apart !!!! Well, no pain no gain as they say....and you certainly gained a gorgeous card. Wow! That is so beautiful!! 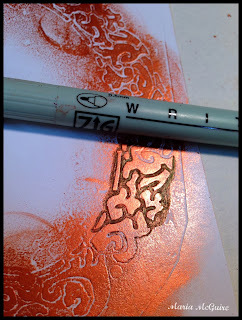 I must try embossing with a stencil. What a great idea! Hope I win this one!! I have cut stencils apart before. A lovely idea for fall birthday cards. Ooh-la-la! 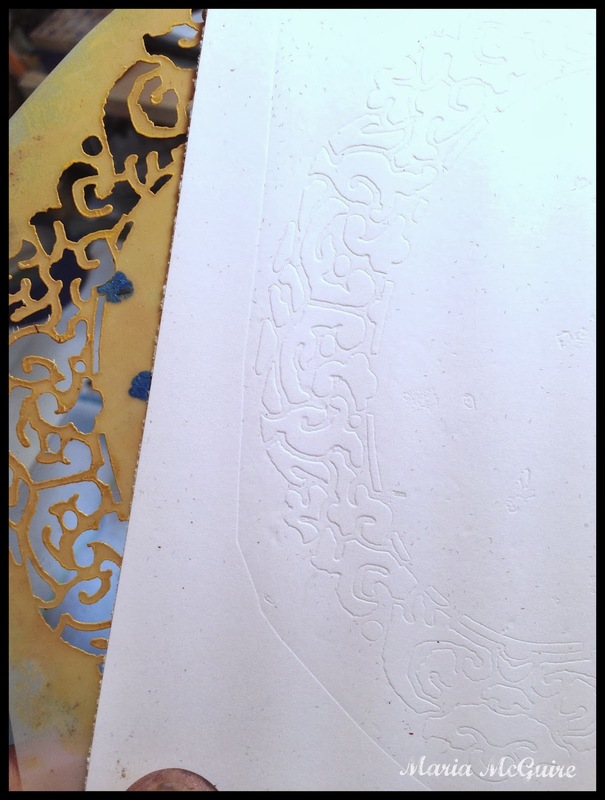 Embossing is such a rich look. I liked being introduced to two new products by Viva. I make all of my own cards...can hardly stand to pay for a commercial one when there are so many creative ways to make them. This one is great. Hey yes cut the stencil if you need to make art. Once I needed lace to use as a stencil and I took down my kitchen curtain and cut it up. 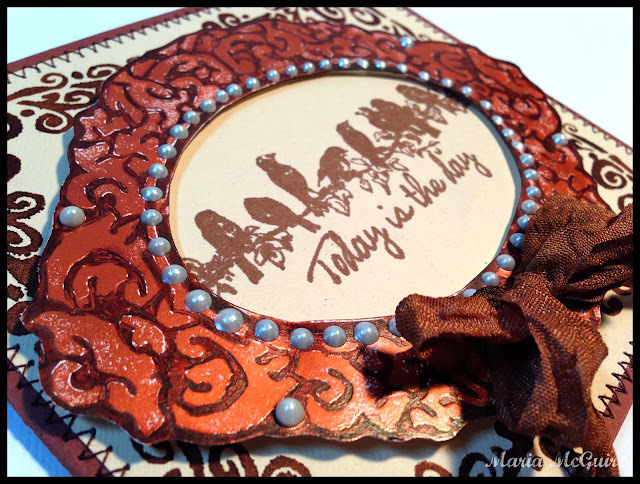 Nice use of the frames stencil! This is a lovely way to use the frames stencil. fantastic idea! wow.. looks amazing! Hi Maria, loved the finished look - almost looks like leather!! What a great idea! 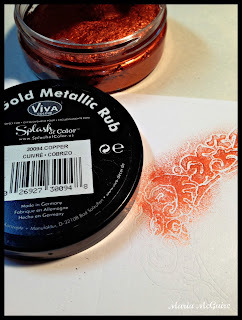 Every blog has used the stencil in a different way and they are all fantastic. Cannot wait to play with the stencils. Thanks. Beautiful Maria!- love those colors-so rich! I'm a card-maker & I LOVE your frame idea! Just think of the possibilities!! OH My! And my grandsons' pictures could be inside the frames, artful lettering inside the frames, small watercolor paintings...the list is endless. On my word....I never knew you could do this! 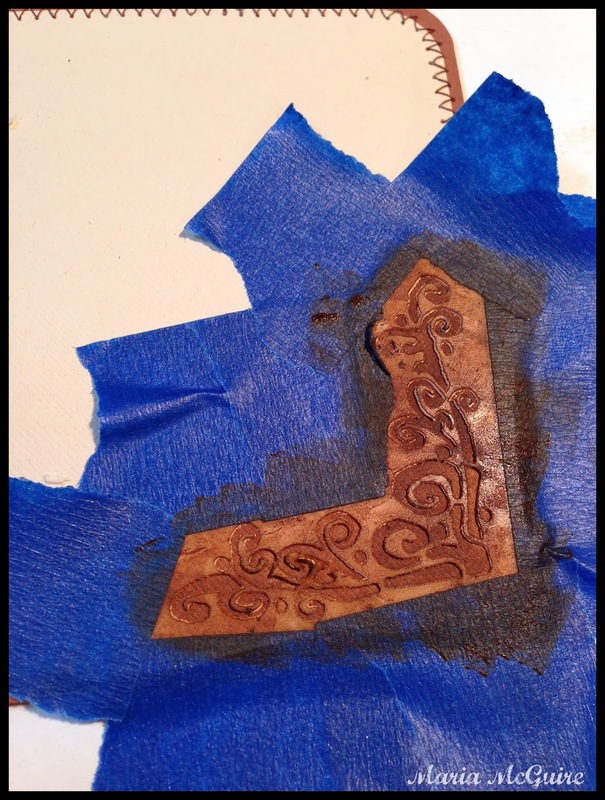 I would think the stencil is too thin, but it worked beautifully! You are one smart cookie! Your card is elegant and beautiful! Love the way the frame sets the whole thing up! wow! Must get me a cuttlebug... That is just beautiful. Thanks for showing this gorgeous technique. What a fabulous tute, Maria!